Niels Bohr was born and educated in Copenhagen, Denmark. He lived, worked, and died there, too. But his mark on science and history was worldwide. His professional work and personal convictions were part of the larger stories of the century. At the University of Copenhagen, he studied physics and played soccer (though not as well as his brother, who helped the 1908 Danish soccer team win an Olympic silver medal). After receiving his doctorate in 1911, Bohr traveled to England on a study grant and worked under J.J. Thomson, who had discovered the electron 15 years earlier. Bohr began to work on the problem of the atom's structure. Ernest Rutherford had recently suggested the atom had a miniature, dense nucleus surrounded by a cloud of nearly weightless electrons. There were a few problems with the model, however. For example, according to classical physics, the electrons orbiting the nucleus should lose energy until they spiral down into the center, collapsing the atom. Bohr proposed adding to the model the new idea of quanta put forth by Max Planck in 1901. That way, electrons existed at set levels of energy, that is, at fixed distances from the nucleus. If the atom absorbed energy, the electron jumped to a level further from the nucleus; if it radiated energy, it fell to a level closer to the nucleus. His model was a huge leap forward in making theory fit the experimental evidence that other physicists had found over the years. A few inaccuracies remained to be ironed out by others over the next few years, but his essential idea was proved correct. He received the Nobel Prize for this work in 1922, and it's what he's most famous for. But he was only 37 at the time, and he didn't stop there. Among other things, he put forth the theory of the nucleus as a liquid drop, and the idea of "complementarity" -- that things may have a dual nature (as the electron is both particle and wave) but we can only experience one aspect at a time. In 1912 Bohr married Margrethe Nørlund. They had six sons, one of whom, Aage, followed his father into physics -- and into the ranks of Nobel Prize-winners. Bohr returned to Denmark as a professor at the University of Copenhagen, and in 1920 founded the Institute for Theoretical Physics -- sponsored by the Carlsberg brewery! 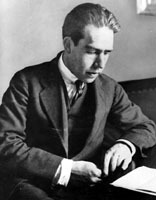 Bohr remained director of the institute for the rest of his life, except for his absence during World War II. Bohr's personal warmth, good humor ("Never express yourself more clearly than you can think," he once said), and hospitality combined with world events to make Copenhagen a refuge for many of the century's greatest physicists. After Hitler took power in Germany, Bohr was deeply concerned for his colleagues there, and offered a place for many escaping Jewish scientists to live and work. He later donated his gold Nobel medal to the Finnish war effort. In 1939 Bohr visited the United States with the news from Lise Meitner (who had escaped German-occupied Austria) that German scientists were working on splitting the atom. This spurred the United States to launch the Manhattan Project to develop the atomic bomb. Shortly after Bohr's return home, the German army occupied Denmark. Three years later Bohr's family fled to Sweden in a fishing boat. Then Bohr and his son Aage left Sweden traveling in the empty bomb rack of a British military plane. They ultimately went to the United States, where both joined the government's team of physicists working on atomic bomb at Los Alamos. Bohr had qualms about the consequences of the bomb. He angered Winston Churchill by wanting to share information with the Soviet Union and supporting postwar arms control. Bohr went on to organize the Atoms for Peace Conference in Geneva in 1955. In addition to his major contributions to theoretical physics, Bohr was an excellent administrator. The institute he headed is now named for him, and he helped found CERN, Europe's great particle accelerator and research station. He died at home in 1962, following a stroke. "An expert is a man who has made all the mistakes which can be made, in a very narrow field."